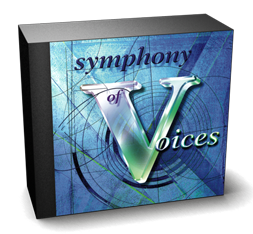 Produced by Eric Persing, Symphony of Voices is a massive FOUR CD-ROM SET, which includes a breathtaking variety of multisamples, phrases & fx from some of the world's most prestigious singers. This outstanding library is an invaluable tool for the serious composer and producer, designed to be inspiring for years to come. Disc 1 is devoted entirely to richly detailed samples of the 80-voice London Chorale, recorded in a large cathedral in England. These are the first sampled choirs ever presented without heavy vibrato, making them much more playable and useful in a wide variety of musical contexts. Performance variations include multiple dynamics of multisampled ahs, oos, ohs, ees, humming, intense staccato stabs, natural crescendo/decrescendo swells, octaves, moving vowels, vibrato versions and even whistling! Disc 2 brings the beauty and power of Classical Soloists to the realm of your sampler. Includes a wide variety of license-free Operatic Tenor and Soprano phrases (both with words and melismatic), in addition to the natural multisamples of each singer. This disc also contains London Choir FX samples, Major, Minor and Suspended Chords with high & low chord voicings, thick clusters, Twelve-Tone and Ligeti fx, whispering, murmuring, accents, falls, avante garde glides, vertigo fx, swoops, chattering, guttural groans, shouts, ethereal phrases and more! Disc 3 focuses on an authentic English Boys Choir and a Gregorian Mens Choir. Many of the sounds on this disc have never before been available to the electronic musician. The Boys Choir features multisampled phrases (Kyrie, Allelujah, Amen, Agnus Dei, etc.) in addition to the soft and loud multisampled static vowels (oos, ahs, ees, mms) and moving vowels (oh-eh-ah and ah-eh-ee-oo). Also includes Solo Boy phrases and multisamples. The Gregorian Mens Choir is provided with multisampled soft and loud ohs, mms, fifth drones, intervals (half and whole step up/down), multisampled Latin words and ancient Gregorian Chants! Disc 4 offers an overwhelming variety of Lush Multitracked Pop Stacks, created from over 10,000 perfect vocal performances! These "Enya-esque" pads are a must-have for Pop, R&B and New Age music. This disc has the most comprehensive multisampled vowels in the collection including oos, ahs, ehs, ees, ohs, mms, vvs and zzs, moving vowels, washes and "scooped" notes. Gorgeous male and female textures that will add that smooth silk to your next hit! "This is one awesome set of samples. You couldn't ask for a more thorough or more musical approach. The sound quality is uniformly excellent, the programming makes using the samples seem completely natural, and the documentation is extensive. You should have no problem finding what you need on these discs...what was not edited out is the human element and the musicality of the samples...Overall, this set is simply stunning. The selection of material is practical and useful..the natural church ambiance on many of the samples is luscious. For classical-flavored music, film scoring, or commercial music utilizing voice parts, I see Symphony of Voices as a must-have tool. It is without a doubt the ultimate library of choral samples. If you want to make those sounds you need this set." "Absolutely BRILLIANT! These are beautiful sounds that will work great in my music. The Gregorian Men and Choir FX are really cool and unique." "The Boys Choir is amazing. We used them in Good Will Hunting. Very Impressive." "FIVE STARS....Recorded & programmed with meticulous precision...the amount of work that went into this project was immense, but how does it sound? Not surprisingly, it sounds very good indeed...the samples work perfectly in a performance context and sound very human, even when covering already familiar single vowel choral territory. In a creative context, the evolving vowel sounds work exceptionally well...usable in a wide range of musical styles...superbly recorded...Symphony of Voices might cost a lot of money, but it is clearly the definitive vocal sampling work, and considering the enormous amount of effort that went into its creation, I have to say that it is worth it. I'm also impressed by the thorough sleeve notes that include a number of practical tips on how to use the samples. Eric and his team have worked hard for their five stars and well deserved they are." "These are the best voices I've ever heard. Mind-blowing!" "Without a doubt the sound quality throughout Symphony of Voices could be described with one word and one word only: flawless. The choir has been captured with a masterful touch of perfection, with lush vocal pads, phrases and effects that are truly inspiring to work with....The performances delivered by all of the vocalists that have been sampled are also first rate and the samples lend themselves well to external processing with reverbs and other effects. Whether in the forefront of your composition or buried within your mix to add subtle texture, one of the most important things that I took note of with this collection is that the samples actually WORK within your music. They're not too obtrusive, they're not too weak and it appears that the producers and engineers who worked on Symphony of Voices have made a very conscious effort to strike that delicate balance between great sounding samples and musical usability and feasibility...Samples that sound great are one thing. Samples that sound great and that you can actually use are a whole other ballgame. Symphony of Voices is one of those rare collections of masterfully created samples that not only sounds great with patches that perform as you would want them to perform, but envelops you in a wall of rich, unique and dynamically inspiring sound. It has a soul all its own...The booklets are extremely detailed and well laid out, making it a snap to find exactly what you're looking for...These probably have to be the most detailed and helpful liner notes I've seen that accompany a sample library, so hats off to the producers of this library for taking the time and putting the effort into creating liner notes that actually help and educate the user/composer using the samples. This makes the library accessible to everyone, regardless of your knowledge or experience in working with choral music....SOV remains one of the landmark vocal sample libraries released to date...every sample on this library is incredibly useful and inspiring to work with..Whether you're doing film, television, album work or otherwise, Symphony of Voices is a masterfully created library of sampled voices that no composer that uses samples should be without." "I have been looking for these sounds for years. The Women and Boys Choir are outstanding. This collection has been working wonderfully for me. Thanks Spectrasonics!" "The quality is really excellent. The Moving Vowels technique is an extremely innovative concept. This library is going to inspire a lot of people!" "SPECTACULAR! Sometimes your samples work better than real singers. The best in the business." "GLORIOUS! These sounds are simply fantastic!" "Totally HAPPENING! The London Choir is awesome. I LOVE these sounds!" "The recording quality is amazing! This is a major help to have access to this quality of samples." "These sounds are incredible! The Pop Stacks are really thick and impressive and the Boys Choirs are brilliant. You guys must have spent a lot of time on this because it shows. I've needed Gregorian stuff before, and now it's all here! This is better quality than anything else out there." "...sounds unbelievably evocative and real...the choir FX are out of this world...recorded and sung so excellently there is no doubt you will be hearing this for many years to come...This is a hugely impressive piece of work...Spectrasonics are to be congratulated on the time, effort and details they have put into Symphony of Voices. If you do any kind of soundtrack A.V. or advert work these CDs are essential. They are going to be as important a tool as the Peter Siedlaczek classical CDs have become and, as such, the price begins to look like peanuts!" "The recordings are of the highest quality, yet maintain a 'live' element that makes them so much more convincing than their synthesized rivals. Probably the most useable CD for pop samplists...a lush, full feel to the recordings....a huge amount of versatility...The well selected singers have great tones of their own, and when they are judicially combined, some of the resultant timbres are mind boggling. The sounds on this collection in themselves make it a difficult one to ignore for samplists needing natural sounding vocals for their recordings. Combine that with the intuitive and useful inlay books, including tips and techniques, and the CD-ROM capability, and Symphony of Voices becomes an absolute essential sampling tool." "First class production all around - 10/10"